Swords & Wizardry Light – D&D in two pages! Erik Tenkar of Tenkar’s Tavern fame has put together a slimmed down version of Swords & Wizardry, the OD&D retroclone, that covers levels 1-3. The game is basically a 4 pager, that is laid out (very colorfully and professionally in this release) as a player’s side and a DMs (Playing the Game) side. 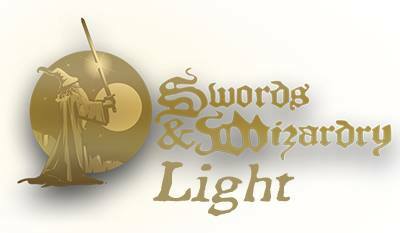 Swords and Wizardry Light as a free pdf download. Read more about this version of Swords & Wizardry and Erik’s plans for support for it over at Tenkar’s Tavern. This entry was posted in Swords and Wizardry by Newt. Bookmark the permalink.